"Are there alligators in that lake?" People who visit our lakeside property and bamboo nursery have asked me that question countless times. At all times, in any Florida lake — man-made or spring-fed — at least one gator is likely to be present. Alligators are aquatic animals. Although they nest in marshy areas and travel over dry land, these descendants of prehistoric predators spend most of their time in or around water. I find that fascinating. Many people find it frightening. "You don't swim in the water, do you?" is the usual follow-up question. I most definitely do, and so does Ralph, our children and now our year-old grandson, Atom. Swimming in a clean, clear, silky-smooth lake is one of life's simple pleasures. The fact that at least one alligator may be in the lake, too, doesn't stop me from enjoying the water. It just makes me more aware. I'm not a particularly brave, brazen or foolish person. I'm just someone who has always liked swimming in lakes, strives to understand her surroundings and appreciates and respects the critters that share her world. Awareness and education are essential when confronting any of life's many dangers. The more you learn about potential problems, the easier it is to avoid them. Alligators are large, scary-looking animals with a mouthful of sharp teeth, a powerful tail and the ability to stay under water for long periods. Although their potential to inflict great harm is undeniable, most of their energy is directed toward the fish, turtles and small mammals that make up their diet. Fatal alligator attacks on people are rare. 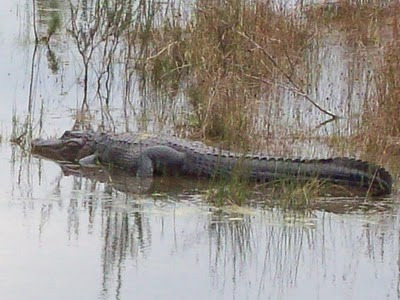 The Florida Fish and Wildlife Conservation Commission has documented 22 alligator-related deaths in Florida since 1948. Figures from the National Weather Service show that more people in Florida were killed by lightning in the past four years than by alligator bites in the past 62 years. I find such statistics reassuring — especially when I'm floating in the middle of the lake or taking an evening dip to cool off after working in the garden. Alligators were a part of Florida long before people. Their ancestors swam in lakes like the one in my backyard 80 million years ago. An animal that has remained relatively unchanged for such a long time must be doing something right. People may not like alligators because they are so large and potentially dangerous, but it's hard not to admire an animal that has so successfully survived and adapted to an ever-changing world. Although I have no desire to have a one-on-one encounter, I respect alligators and enjoy seeing them in the wild. Anyone who can get past the fear factor will find these armored creatures captivating to watch. But watching them is all that should be done. Under no circumstances should anyone ever feed a wild alligator. Not only is feeding these large-bodied, small-brained animals illegal, it's what causes them to lose their natural fear and act aggressively toward people. When it comes to alligators, our imagination gets us in trouble. Allowing fear to replace common sense may be easy to do, but it's not particularly helpful. If we spent half as much energy evaluating facts as we spend concocting scary scenarios, we'd be safer, saner and more in tune with nature. We'd also enjoy swimming in clean, clear, silky-smooth lake water without unnecessary worry and fear. Okay, but if Atom's first sister gets named Poke Salad Annie, Watch Out!